Over 5000 children are benefitting from this program, considerably reducing water-borne diseases and the incidence/frequency of diarrhea, fever, fatigue and stomach worms.The availability of flush toilets has helped all, particularly female students. With hygiene training, we see behavioral change in the community with hand washing as a norm. School attendance is up, particularly for girls. In conjunction with other programs, we are transforming the community. As part of their five-year plan for community service, the Guatemala Sur Rotary Club identified the area of water and sanitation as a priority for nine elementary and seven secondary schools in Sumpango. For over a year we had several exchanges about the scope of the project. We visited Sumpango, met with the mayor, Lic Efraín Paredes Gerónimo, visited the schools and talked to the principals. A mutually agreeable plan was developed and all parties pledged their complete support including community people in various trades who provided sweat equity to do the various jobs. Thus, the project became a community project as opposed to “our” project. 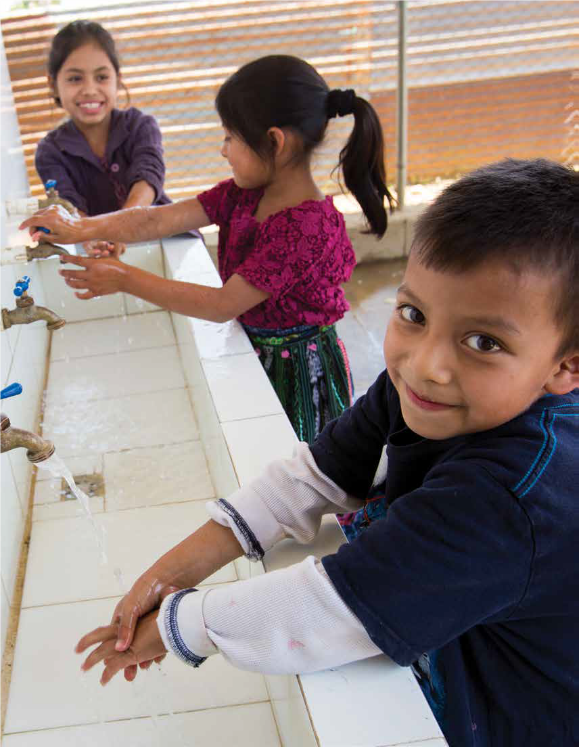 WASH project was implemented at nine elementary and seven secondary schools in the villages of Sumpango municipality: El Rejón, El Chipotón, Rancho Alegre, San Rafael El Arado, El Tunino, Santa Marta, San José El Yalú, El Guachipilín and San Antonio las Flores. None of the schools had running water. As shown, women brought water from remote places: hand washing was done sparingly with the use of bottled water: and toilet conditions were very poor, causing serious health problems. The children did not engage in hygiene practices. Locate a nearby well or water tank (provided by the municipality) and pipe in water to each of the schools. Process the water through a chlorinator to improve its quality. Pipe in the water to a local storage tank installed on the school building. Distribute the water to newly built wash and drink stations. Build gender specific toilet stalls. Install flush toilets in stalls with septic tank for waste disposal. Provide water to the kitchen with sink and other amenities. Role of the Rotary Foundation: The Rotary Foundation (TRF) grants officer, Maria Emig, and WASH area of focus manager, Erica Gwynn, have been immensely helpful in guiding us through TRF guidelines and aligning our application accordingly. The Rotary Foundation also contributed approximately $150,000, about 60% of the budget, towards financing the project from the World Fund and District Designated Fund (DDF). Role of the Host Rotary Club: The work was performed under the supervision of Rotary International Director (RID) Jorge Aufranc of Club Rotario Guatemala Sur, District 4250. Special kudos to Rotarian Francisco Viau, who served as project manager during the entire time and was engaged in planning and implementation aspects of the projects. A dozen members committed themselves to this project going to Sumpango on a weekly basis to oversee progress and plan future activities. 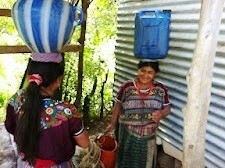 The Guatemala Sur Club members are dedicated, committed, hard-working and passionate. They get things done!! Funding Partnerships: The Barrington Breakfast Rotary Club, District 6440 created “partnerships” among our Rotary friends within multiple districts and clubs – a hallmark of a Rotary’s Four Way Test: “Will it build goodwill and better friendships?” Major contributions came from District 6440 and District 7820 clubs along with DDF. Other contributing districts are: 4250, 6060, 6330, 6450, 6650, 6930 and 7040. Finally, there was also a contribution from WASRAG. We created a multi-country, multi-district and multi-club partnership. Alliances: We built alliances among people with various stakes to come together and define, implement, and enjoy the benefits. This involved the Sumpango Municipality Government, school principals and teachers. The community people in various trades contributed sweat equity with their time and effort to build things required for the projects. The Mayor of Sumpango with the support of its council committed funds as well as manpower for the project. Frequent meetings were held with him and his staff to plan and implement the project. With hygiene training, we see behavioral change in the community with hand washing becoming a norm. School attendance is up, particularly for girls. In conjunction with other programs, we are transforming the community. The project is fully sustainable in that local people built the various facilities with local materials and local know-how.The municipality has taken the responsibility for maintenance. Our project responded to the needs identified through many meetings with community members and leaders over a long period.Thus, the project became a community project as opposed to “our” project. We pursued the theme “Bigger, Better and Bolder.”We chose to have large projects both in scope and budget resulting in benefits for thousands of children and adults. Relationships that have developed over these years are significant.We have all developed a greater understanding and appreciation of each other. We teach and support each other. We challenge each other when called upon.And, yes, things get done.But we are also building community.And an international community at that.This is no small feat and very much aligns with Rotary's commitment to promoting world understanding, goodwill and peace. There is an impact as well on us as individual Rotarians having a sense of satisfaction and accomplishment.